It's Lovely! I'll Take It! : All this could be yours! C'mon in! Make yourself comfortable! "Maybe if I flash them a nice smile, they won't notice that the guy next to me looks like he might be rolling a joint." "hey guys... you wanna make some space - I gotta take a picture here... No? Okay, suit yourself" - and they get listed along with the fridge. If THAT is recently redecorated I'd to have seen the befores! wonder why they're collecting empty toilet paper rolls???? Wowzers! Wonder what the old decor looked like? My guess is they're all in line for a shot at that chick who looks like Steve Perry. Well, looking at the 'current tenants', I'm not surprised. Massey University students always seem to take a while to earn their degrees. It's also encouraging to see the boyz keeping the side up by consuming vast amounts of Tui (the cheap, crappy, and depressingly omnipresent local beer). And it's nice to know someone, somewhere still likes the Foo Fighters. I am never, under any circumstances, moving to Palmerston North. Do the frat boys come with the frat house or do you have rent them separately? They look so cold, yet they're wearing shorts! I've just looked at the rest of the listing and the 14 "lovely" photos - hmmm not sure any of them are going to sell that house...even the external shots contain dubious racks of drying washing! Kiwis and beers... what more would you want for a party! I wonder if the house comes with that extensive bottle collection by the sofa. Okay her is my plan. 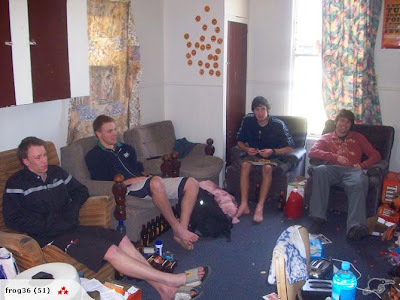 I buy the place and let the tenants stay and then rent out one room as a kind of "college party house" fantasy camp. We can charge older suburban guys to spend a weekend twisting fatties, drinking cases of "Tui?" and not cleaning. Kind of like those baseball or rockstar camps. This is every man's dream. This place is a gold mine. Sign me up. The place is an effing mess and the photographer must be an absolute idiot. I have to say it - 5 bedroom with ONE bath!! You'd have to pay me to share a bathroom with 4 other people. And what the heck is a 2 bedroom house with 3 room sleepout? Great, I was just looking for a house with 4 boys. Did anyone notice the 2 TOASTERS in the middle of the floor? Yikes! Is that one guy rolling a joint?!? If I get a matching windbreaker in the deal I'm SOLD! God....this reminds me of most of my guy friends' places in college. I DO NOT miss this. He'll be rolling a cigarette most likely - they're quite popular here. Oh, and it's a rental, not for sale, thankfully, so not quite so bad - though I guess they're just not looking to tenant the property with anyone any better than these guys if the photos are any indication. Aah, students... bless. I CAN SMELL THE AROMA FROM HERE! Recently redecorated? By frat boys! Lots of parking? All over the lawn! Aaaaah...I miss college. The days when I could drink a beer in the shower while getting ready for class. I could hang out all day and watch tv and drink beer. Fifteen years ago, I might have been in this picture! What is with guys and not tossing out the toilet paper tubes? Is it a pride thing? "look what I did! YEA"
I don't think it's a cigarette, it seems like he has a plate of what might be food on his lap. This is absolutely disgusting, and if a picture hadn't shown it, it would STILL be obvious that men live in that house! lol. And all over the wall. Is that labels of Tui they've peeled off? The interior is horrendous, but the shopping carts and two-tone paint on the outside are nice (first and second photos). Leave the house, but I'll take the guy in red.